The Story Of '4'33"' Cage's "intense" musical composition consists of a pianist sitting at a piano and playing nothing. 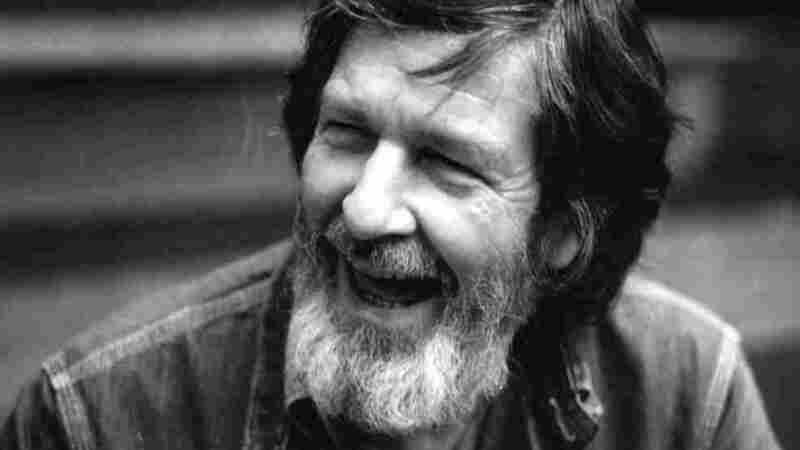 John Cage was born Sept. 5, 1912. On what would have been his 100th birthday, we remember the composer with a report that aired on All Things Considered in May 2000. It's a warm and rainy evening in August of 1952. The place is a tiny auditorium, appropriately called the Maverick Concert Hall. Built in the early part of the century by an eccentric poet and novelist named Herve White, the building is at the end of a dirt road in the middle of the forest near Woodstock, New York, an artists' community about two hours north of New York City. The Maverick is a lopsided plank-and-nail affair that seems a cross between a barn and a country church. The support beams are stripped logs. On one side, a huge oak tree grows through an opening in the moss-covered roof. The doorways are set at odd angles and window panes are scattered across the whitewashed pine walls like dominoes. In the audience is a broad cross-section of the city's classical musical community, including composers like Morton Feldman and Earl Brown, whose works are being performed this particular night. Also present are some vacationing members of the New York Philharmonic, looking to keep up with the antics of the new music renegades, and composer John Cage, who's premiering two new works. For the first, which would later become known as "Water Music," pianist David Tudor, a lifelong Cage collaborator, plays prepared piano, a duck call and a transistor radio. For the second, the provisionally entitled "Four Pieces," Tudor starts a stopwatch, sits down in front of the piano, closes the lid and begins a performance in which he never plays a note. After 30 seconds of silence, Tudor resets the stopwatch and times another two minutes, 23 seconds of silence, then another one minute, 40 seconds of silence. But is it silence? In the Maverick that night, one could likely hear the sound of the breeze in the trees, rain pattering lightly on the rooftop, the chirping of crickets, a dog barking aimlessly somewhere in the distance, the sound of bodies shifting their weight on creaky pine benches, the sound of breath being drawn and being expired. Good people of Woodstock, let's drive these people out of town. This was music for John Cage. And unlike compositions designed to make the outside world fall away, here was a music that, when it engaged you, made the present world open up like a lotus blossoming in stop-motion photography. It was all very much in keeping with Cage's Zen world view, which emphasized the power of unmediated experience and direct perception of what Cage called the "isness" of life. The silent composition, which became known by its duration of four minutes and 33 seconds, was influenced by Cage's encounter with the so-called "white paintings" by his friend Robert Rauschenberg — huge canvasses of undifferentiated white whose surfaces vary infinitely with particles of dust and light reflections. He was also influenced by an encounter with an anechoic chamber, a room scientifically designed to maintain absolute silence for various types of acoustic testing. In his famous collection of essays titled Silence, Cage wrote about entering such a chamber at Harvard and hearing two sounds, one high and one low. The engineer of duty informed him that the high-pitched sound was that of his nervous system, the low one that of his blood in circulation. It spurred an epiphany for Cage, one that would focus much of his musical attention on ambient and accidental sounds as opposed to willful, compositional ones. "Until I die, there will be sounds," he wrote, "and they will continue after my death. One need not fear about the future of music. Any sounds may occur in any combination and in any continuity." As one might expect, many listeners found this view unpalatable, despite the fact that the hall itself could be a metaphor for Cage's ideal union of music and nature. There was an uproar. People thought 4'33" was a joke or some kind of avant-garde nose-thumbing. During a post-concert discussion, as Cage biographer David Revill notes, one local artist stood up and suggested, "Good people of Woodstock, let's drive these people out of town." But, in fact, Cage's little silent composition was no joke and it would have an incalculable, if characteristically quiet, influence on a great deal of music that came after. The emerging technology of portable recorders permitted the cataloging and manipulation of environmental sounds by musicians. Composer Steve Reich explored the rhythms of the human voice and of trains. The sound of the ocean was as central to The Who's Quadrophenia as Pete Townshend's thrashing guitar. Brian Eno, who credits Cage with inspiring him to become a composer, recorded a series of so-called "ambient" albums, music of a quietude, designed to compliment rather than compete with the sounds of life. Today hip-hop producers use street noise in their musical fabric and DJs use vinyl LP surface noise to communicate nostalgia and authenticity. In a sense, Cage gave musicians aesthetic permission, spiritual encouragement even, to go beyond the tonalities of standard instrumentation and engage with the infinite possibilities of sound. While he composed prolifically until his death in 1992 at the age of 79, Cage remained more well-known for his ideas than his music, and the enigmatic 4'33" is the ultimate expression of those ideas. "The most important piece is my silent piece," he affirmed. "I always think of it before I write the next piece." One critic called it "the pivotal composition of this century." Pianist David Tudor called it "one of the most intense listening experiences you can have." But all this puts a weightiness on 4'33" that seems at odds with its playful sense of simply being allied to the world. As Cage writes at the end of his Silence, "I've spent many pleasant hours in the woods conducting performances of my silent piece, transcriptions — that is, for an audience of myself."' By inviting us to do the same, Cage transformed the art of music, and the art of listening, irrevocably.